This has always fascinated me. The fact that most of the most renowned figures of the history of our sport come from the land in order to escape the hard life of it. Especially between circa 1905 and World War II. In Belgium they were the historical "Flandrians", heirs of Cyrille Van Hauwaert. Brik Schotte was nicknamed "The Last of the Flandrians" because he was the last of a generation when farmers were predominant. In France, Henri Pélissier or Antonin Magne were farmers. In Italy, Costante Girardengo, Gino Bartali or Fausto Coppi all had to work hard on the land. After World War II, things changed a bit and many came from the industry but there still have been a lot of riders with at least a cycling past: Raymond Poulidor, Joaquim Agostinho, Hennie Kuiper, Adrie Van der Poel, Paul Wellens (and his two brothers, Tim's family), Marc Madiot and his brother Yvon. Bernard Hinault became a farmer after his career but did not grow up as a farmer and he sold his farm in 2006, I think. 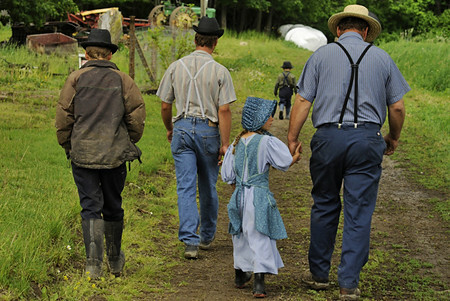 In his book Marc Madiot said that in his days, about 80% of the field came from the rural world. It was the sport of the "lower part" of society, long thought be practiced and followed by "rednecks" (well my translation of "bouseux" in Madiot's book, which is an insult for farmers). These stereotypes still remain a bit from the viewpoint of Paris, he argues. ..and was wondering if there were so many cycling farmers in the current peloton or among recently retired, since the century, let us say! Yves Lampaert is the best known example to me. He's said to have refused to purchasing a Porsche but rather a tractor and is nicknamed John Deere. Otherwise, I think Rui Costa and Michal Kwiatkowski have at least a farming past. Mark Renshaw, apparently, Gianni Moscon, Frederik Backaert, Stijn Devolder, Stijn Neyrinck, Wim Van Sevenant, Kevin Pauwels (the cyclocrosser), etc. not quite farming, but when I was in Romania for the Turul Romaniei, I had a chat with Massi-Kuwait DS Luc Schuddinck, who said that unfortunately one of his most talented riders, Oskar Malatsetxebarria, couldn't compete because he has to stay at home in the Basque highlands, herding the goats. Sean Kelly was from a farming family, and if not for cycling, does not seem (how can I put this politely?) to have been academically inclined to moving to a more professional career. Landis might be the only American rider to whom this could apply. Not only did he grow up in a strict Mennonite family in Pennsylvania, he literally grew up in Farmersville, part of Lancaster County, on Farmersville Road. The road stretches for miles of white farmhouses, red barns, cornfields, and silos, with no variation except when maybe the farmhouse is red and the barn is white. Oh dear, how could I forget about Sean Kelly. When Jean De Gribaldy wished to offer him his first pro contract with Flandria, he went to unannounced to Ireland, with another rider in order to find him and to serve as interpreter. They found Kelly driving a tractor and went to his half brother's place. And for sure, by 'farmer' I meant all the jobs linked with the primary sector of economy. So shepherds sure belong here. Wasn't José Rujano a coffee planter? I'm sure that many of these South American riders have at least a farming past. Landis' mother looks like an Amish that I saw in Peter Weir's Witness. Wasn't José Rujano a coffee planter? A former coffee farm worker, the 29 year old also revealed he still holds the local record for planting the most coffee plants in a day. Gianni Moscon enjoys apple farming. His family are apple farmers, and he likes to help out when he has time. That's why I liked Gianni Moscon before happened what we know. An accordion player as well. Let us remember Igor Decraene here. Along with his four brothers, he would help out on the family farm. Typical for farmers, he would thank his parents after his junior ITT World title in 2013. He passed away in a car crash under a train, after heavy drinking, in August 2014. The 27-year-old is a full-time professional cyclist for Wanty-Groupe Gobert and a part-time farmer on his family’s 95-acre plot in the Belgian town of Brakel. They make their own dairy products and grow their own crops. Morning is for training; sometimes, he will spend the late afternoon milking their 90 cows, cleaning machinery or ploughing fields. He grew up a stone’s throw from the foot of the Berendries, a climb used in several top Belgian one-day races. Like most kids from Flanders, Backaert dreamed of winning De Ronde, not the maillot jaune. “We don’t care about the Tour,” he says, laughing. Thévenet was born to a farming family in Saône-et-Loire in Burgundy and lived in a hamlet called Le Guidon (The Handlebar). It was there in 1961 that he saw the Tour de France for the first time, on, a 123 km stage from Nevers to Lyon. Thévenet was a choir boy in the village church. He said: "The priest brought forward the time for Mass so that we could watch the riders go by. The sun was shining on their toe-clips and the chrome on their forks. They were modern-day knights. I had already been dreaming of becoming a racing cyclist and that magical sight convinced me definitively. It was never that magical when I was actually in the peloton of the Tour!" His parents needed him on the farm too much to be keen on his racing, but they knew their son's ambitions. Thévenet rode his first race and his parents found out only when they read the local paper. There was a row and the club president intervened by inviting the parents to see their son's next race. Thévenet won it. 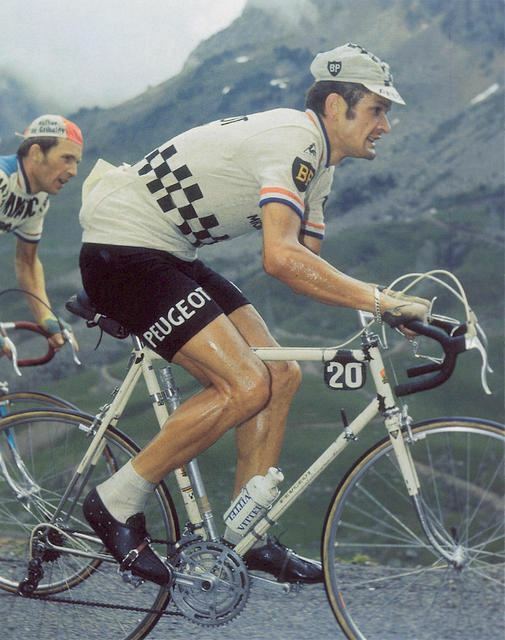 In the 1975 Tour, Thévenet attacked Eddy Merckx on the col d'Izoard on 14 July, France's national day. Merckx, who was suffering back pain from a punch by a spectator, fought back but lost the lead and never regained it. Beside the road, a woman in a bikini waved a sign that said: "Merckx is beaten. The Bastille has fallen." Thévenet - who had taken the climb on the larger chainring - went on to win the Tour, which that year finished on the Champs-Élysées for the first time. Merckx finished second, three minutes behind. [Nairo's father] Luis was a disabled campesino who farmed potatoes and ran a roadside grocery stand. From the time he was six, Nairo had been helping his dad, whose pelvis had been crushed in a childhood car crash. Nairo delivered milk and lifted heavy boxes of produce. When the Quintanas went to markets in the neighboring villages, Nairo sometimes woke at 4 a.m. to help his father bake bread. They lived in a village called Combita high in the Colombian Andes, in a verdant farm region known as Boyaca. Luis saved up a year to buy Nairo the bike. He bought it partly out of gratitude, and partly for practical reasons. The bus to Nairo's school, 10 miles away and 3,000 feet below their hilltop home in Combita, cost 25 cents each way. In some ways, it was a miracle that Nairo was even alive. At age two, he fell sick with a serious fever. His parents believed that someone who'd touched a dead person had, in turn, touched Nairo thereby infecting him with an illness. For a year, the boy had constant diarrhea; he vomited and could not sleep. No doctor could help him. The Quintanas went to Our Lady of Miracles, a gold-domed church in Boyaca's capitol, Tunja, and prayed. Finally, they called in a faith healer who gave Quintana herbs. He recovered. He was a bone-thin kid, with a sharp, narrow nose and intent brown eyes, and he was never athletic. He hated gym class, but he milked the family cows; he fed the chickens. "I was happy to buy him the bike," says his dad. He does not endorse any products in Colombia and he has leveraged his celebrity only once—in 2013, when he voiced support for Colombia's farmers as they waged a nationwide strike, pressing a resistant Santos for aid. "When you bring a sack of potatoes to the market, you have to cry," he told reporters. "You won't even make the money you need to pay for transportation. My family lost some of our land years ago, so we had to leave the potato business." When we got to a roadside cafe, the two riders sat down for coffee, and Quintana called me to join them. With regards to the farmers' strike, he said, "My family are peasants, and so am I, and in a strike like that, where the army and police are involved, fighting the farmers, there is sometimes internal conflict in families: Many of the people in the army are also the sons of peasants. My brother is in the army, you know." "I'm losing my identity as a peasant from Boyaca. I know this; I'm traveling all over the world to races. But I have not forgotten the countryside. I have some cattle here and I have someone who takes care of them, and when I'm finished with competitive cycling I will return to my roots. This is my region. This is where I am from, and this is where I would like to be." Before he turned 16, Quintana landed on a local team, Boyaca es Para Vivirla, who canvassed door to door for funds. Then, when he traveled to France for the Tour de l'Avenir in 2010, he was reportedly subject to racist attacks. "It was the first year Colombians were back in Europe," says Ignacio Velez, a Colombian businessman who coordinated the trip, "and the French team was very aggressive." They called the dark-skinned Quintana a "flipping Indian," Velez says, and shoved one of his teammates to the pavement, prompting the rider to remount, catch up, and slug the Frenchman in the face. "It was Nairo's first tour," Velez says, "but he didn't care. He was confident, and one night he came to my hotel room, very shy, and said, 'Coach, it is me who will win the Tour de l'Avenir.'" Peter Van Petegem also owned a farm, actually. I read an article from Velo Magazine back in 2003. They followed him for his whole "glory week" after he won his second Tour of Flanders and before he won Paris-Roubaix. I remember reading him say "I get up with the chickens". In 2009 he and his wife transformed it into a "bed & breakfast", giving it a suitable name: "Le Pavé". I'd like to translate to you the video in the OP about François Bidard, which has been posted on 1 October, this year. The sun has hardly risen on Lonlay-l'Abbaye, in the department of the Orne (Normandy). In the Bidard's farm, everybody's already at work. Like every morning it's milking time for the 80 cows of the holding. That day, François, the elder son has come to give his family a hand. We were born in this milieu and for me it's natural. For sure afterwards in the heat of the season it's hard to combine the two but in these off season moments we make the most of it, you know. François Bidard is a professional cycling rider and as usual he capitalises on his few rest days to come back to the farm. I've always known him like that. He's always had that passion for agriculture, so for us it's natural but for some it might seem funny to see him [in a farm]. Well in another context it's true that it's not logical but well people may also have a passion next to cycling. François' life is actually a double life. When he leaves the farm and his boots behind, 26-year-old François Bidard is shifting gear. It's here on the roads of the Orne département that the young rider has made his first steps into cycling and won his first races but his career suddenly got a boost far away from his own Normandy. Two years ago François signed his first pro contract at AG2R, the greatest French team at the moment. François gradually made his way among the stars of the peloton, like his leader Romain Bardet. As the months went by, the little Norman has very quietly kept progressing. In my first year I raced the Tour of Spain and then I raced the Tour of Italy twice, so I hope the Tour of Fance is for soon. As he was 37th at the last Tour of Italy, François is establishing himself as a very good climber, as an examplary domestique who can be trusted with the wallet; a mental toughness that might be rooted in his farming childhood. It hasn't always been easy with my parents at the farm. I have to say. I saw my parents a bit in trouble [milk prices?]... But then when you have to go for it, you go for it. You don't have the choice. In cycling it's the same. When you have to go for it, you go for it. Three weeks of racing, 200km a day and it's raining, it's also part of the job. I think it must build character a bit, yes. As soon as he can François comes back home on the family farm. A necessary come back to the roots between two races across the world. It's true that sometimes he phones us and we are always asking "where are you? ", we are always wondering where he is and what he's doing and then the following day he's back. Always the same. He always remains simple, humble, like we also like simplicity. So it's convenient for us. In a few years I'll come back and will be in this building (smiling). For me the solution is simple. It's getting back on the farm. It's what I've been doing right from the start, all the studies I've carried out as well. It's really a wish that I may get back on the family farm and to take over. All in good time! There are still nice years to come in cycling and then let's put back the boots. Before fully dedicating himself to farming, François Bidard is leading is double life, with passion. The sun has hardly risen on Lonlay-l'Abbaye, in the department of the Orne (Normandy). 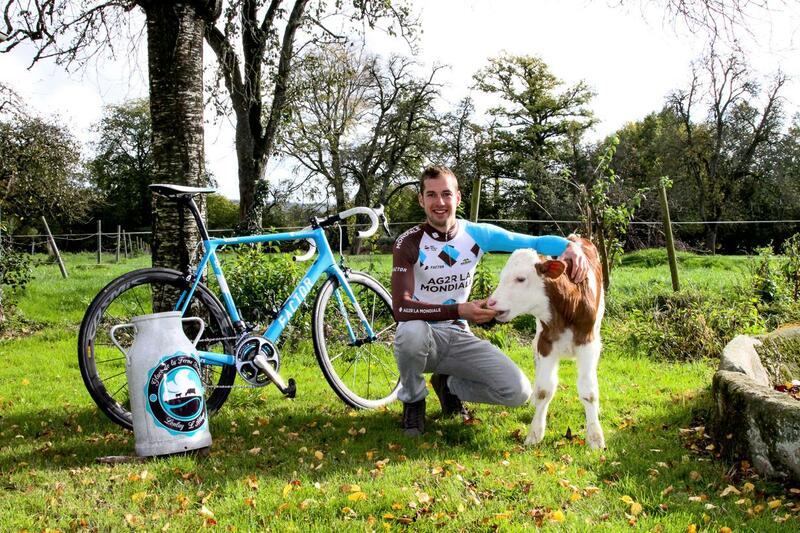 he's planned to go farming after his cycling career. He's already bought a tractor in winter 2015/2016. A big one! Therefore I had to pass a G-driving licence. As a kid I was already driving round with a small tractor. So he wants to emulate Bernard Hinault in a way. I know, farming is hard labour but cycling is even harder. An interview with Stijn Devolder is one with a lot of questions and short answers but when you ask him about picking potatoes, then his ceruean blue eyes are shining with happiness and complete sentences are flowing one after the other. While his colleague riders are flying off to the Maldives, Stijn Devolder is driving round with his tractor in the West-Flemish fields. I'm an outdoorsman. I get wild when I'm in a hotel room. Agriculture is my passion. This year I went for two days to an agricultural fair in Hannover. I haven't missed one stand. Crops, livestock, milk cows. I want to handle everything. By the way I've just told you that those training are boring. Actually not. During races I'm constantly having a look at the meadows around. This is an article from April 2016. Three years later, Stijn is still planned to be a cycling rider. Whatever one might think about him as a rider, I think we should wish him to succeed in his second life. Speaking of farms, do you remember when we had a discussion about reindeer herding? I ran across something today that is both about farming, and with perhaps not much more action than reindeer herding! Ploughing Championships! I didn't know there was such a thing! They have nationals, and worlds, and they give the leading plowman a yellow jersey! Cyclocrosser Stan Godrie of Crelan Charles is also a farmboy of Zundert, though born in Breda. As is clear from his (current) Twitter account. He seems to have 20,000 sheep and there you go with your 10 hectares [24.7 acres] of leek. Outside of racing you tend to spend a bit of time on the farm back home in Tassie. Can you talk about the farm and the significance of that? It’s Campbelltown, which is sort of 70k’s south of Launceston. Is that something you see yourself throwing more time into once your career as a pro eventually comes to a close? Yeah I think after I finish cycling I’d like to go back and help out. My brother’s always asking me ‘When are you coming back?’. I think he thinks cycling’s a bit of a game. It reminds me of an old thread on CN about all those Aussie riders coming from Tasmania, by the way. Bernard Hinault became a farmer after his career but did not grow up as a farmer and he sold his farm in 2006, I think. Schmalz: What was it like being Hinault’s teammate? Were you afraid to ask him to pass the salt when you were at training camp? Was he intimidating? Hampsten: No, he was the nicest teammate you could possibly have. His last year, he was grumpy. You see this with older people (like me) and older riders. They don’t like training in the rain, every time it snowed, one snowflake, the entire team would go to him, "Hey, this is like Liege Bastogne Liege, 1978 when you…"
In his last year, he was looking forward to retiring. He obviously liked racing, it was fun, but he wasn’t patient with the bullsh*t. He didn’t like to be teased by other riders, he had a huuuuge reputation, he really just wanted to get home and farm and get all this racing behind him. But if he was going to race he was going to be serious about it. But he was also extremely generous with his knowledge with anyone on the team, especially younger guys who asked or showed respect. Hampsten: Well, if you remember in ’84, and this is all hearsay, but I’m pretty good with my sources, in ’84 Moser and a helicopter pilot collaborated to help him and push, the helicopter pilot stayed behind Moser turning his turbines, being behind him, so the wind pushed him forward, and he won the Giro by cheating in the time trial. Against Fignon. So Fignon was leading in ’89, and Moser was one of the race directors, and essentially cancelled the stage because it was going to be cold, it snowed overnight, but it was sunny and it melted…there was some flimsy excuse that the road was out. They were talking about an avalanche in another part of the valley, that the road wasn’t good enough for the race, for the finishing equipment and the trucks to make it over. Total bullsh*t.
It was a bit of a… "Sorry about the helicopter, here you go." I remember reading that interview a few years ago when JSG requested me to make some profiles for Tour of Italy greats and I picked that rider but it seems that Hampsten is correct and I was wrong, Hinault bought his farm while still a cycling rider. I have long dreamed to own a farm and a property. In 1983, I bought a land, close to Dinan. I didn't wish to immediately settle there because I know myself a little bit: I would commit myself to working the land instead of training. One of my cousins who is an agricultural technicians was busy with the property. I quickly realised that with the new European economic measures, the dairy quota, taxes, you could no longer live with several people on that holding. That is how I accepted to work for the "Tour of France company" as advisor to Directorate. Besides, I was also wrong about the fact that Hinault's parents did have a farm but his father was also an employee at the SNCF (French railway), he setted the rails, hard job. After primary school, he started working as a vegetable grower at home. There was work all year long with beans, carrots and onions. You have to plough, prepare the land, grow, plant and transplant. Beforehand you had to clear out all the weeds and hoe. Then in summer, we pick everything. There were years we did more than a ton of beans. We grow onions on boards of 1 meters 50 by 6 meters. When they are half a centimeter wide, we pick them, one by one and we transplant them in February and March. Late summer, we pick them and put them all on boards. We did almost ten tons of onions. we sold them all to the cooperative. It kept the ends meeting and left me some times to train during the week. Also his parents never owned a car, they only rode by bike. I found back my copy of the Vélomagazine with the article about Peter Van Petegem. It's #397, published in May 2003. After the press conference, we found back the calmness of our home. I went to feed our donkeys and our geese. We live in a farm that we are restoring. The habitable part of it is over but not the garage yet. It's an old-style typically Burgondian house, built on recovery stones. I don't personally work a lot on it but for ordering and paying. We enjoy living in it, far from pressure and close to the Flemish climbs. When I'm in my garden, I can see them all around: Molenberg, Paterberg, Berendries. I go to bed early everyday. Yesterday for instance we were in the bed at about 9.30 to 10pm. I'm a bit like the chicken. I go to sleep and get up with them, which means at about 6.30am, in order to meditate a little and to enjoy sunrise. I spent the rest of the day quietly, if only for the telephone which constantly rang, until we plugged it off, so that I could only be reached on my mobile phone. My pleasure is going out and looking at our animals. I have three donkeys and a funny detail about them: the third one landed on our meadow without our knowing because we didn't know that the mother was pregnant. I also have three sheep, a goat and a dog: a jack-russell. I'm an outdoor man. My father is someone who produces everything by himself: all vegetables, the chickens that we eat, turkeys and guinea fowls. So this is the men's road cycling section but we've got an amazing story in women's cyclocross: Kim Van de Steene! She's now 32 years of age and started cyclocrossing at age 25. Her parents wouldn't allow her to race because of all the work that needed be done in her parent's farm, like getting up at 4.30am to milk the cows and sometimes to help out when a cow gave birth to a calf. She still combined the two between 2011 and 2016, plus working part-time as a logistic assistant at the Ghent university hospital. Mentally that was too heavy and she had to make the hard decision to leave the family farm. Still her childhood dream was becoming a farmer. Now she's got a better schedule at the hospital, working from 9am to 1pm. She's constantly on the move, getting wheelchair patients from their rooms to surgery rooms, etc. She also has her own "care farm"/ "children's farm", for children and disabled people. She organises parties for children's birthdays. She trains on Tuesday and Thursday afternoon from 1 to 4 pm and everyday 1 hour casually riding to work or school with a bike-cart. 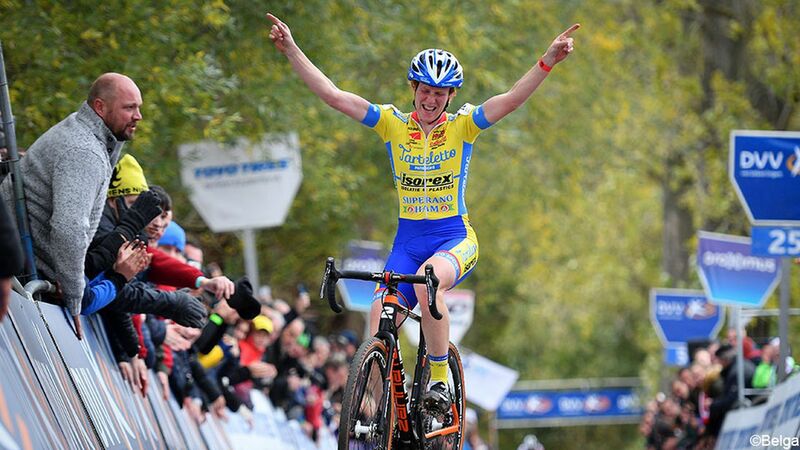 This season, she's won the Superprestige event in Boom and the IJsboerke event (women's equivalent to the challenge formerly known as B-Post/GvA in men's cyclocross)... on the Koppenberg, no less! Marzio Bruseghin raises donkeys. He already did while a cyclist and his fans sometimes wore these donkey ears headpieces when they came out to races. 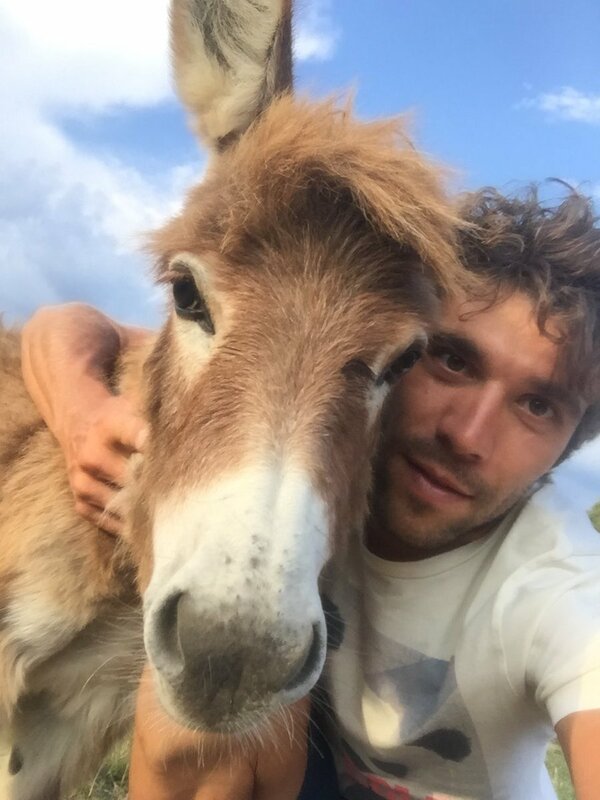 I remember one year Alessandro Petacchi dedicated a stage in the Giro to one of Bruseghin's newborn donkeys because he had run out of people to dedicate wins to. Bruseghin also owns seven dogs and has fields with the grape Glera that is used to produce ecological prosecco wine sold under the name of Amets, basque for dream and Amets Txurruka's first name of course. Marzio was a really great rider that won three races in his career; the national time trial title in 2006, a mountain time trial to the monastery Oropa in the Giro d'Italia 2007 one second ahead of Leonardo Piepoli, a non-mountain time trial in the 2008 Giro where he also finished third overall. He lives in Piadera close to Vittorio Veneto. I remember one year Alessandro Petacchi dedicated a stage in the Giro to one of Bruseghin's newborn donkeys because he had run out of people to dedicate wins to. THAT is how you know you've won a lot of races! a mountain time trial to the monastery Oropa in the Giro d'Italia 2007 one second ahead of Leonardo Piepoli. I'm quite fond of donkeys, though. I only recently discovered that they're quite effective at guarding chickens and sheep against foxes and coyotes. 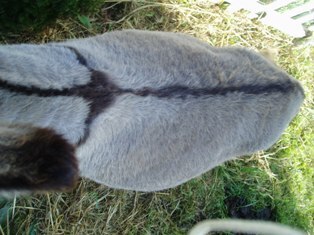 They also naturally have crosses embedded in their fur. For sure. 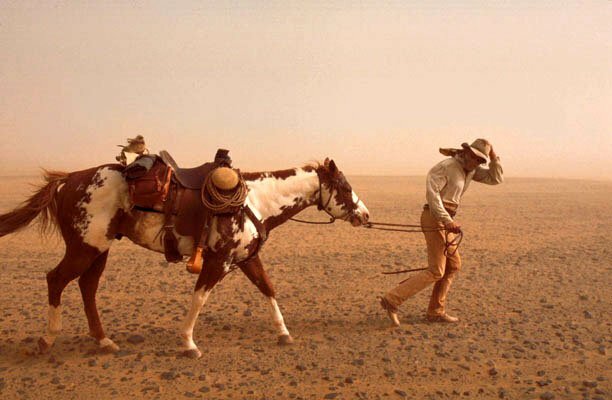 If I had a team I would hire only mules and donkeys that never tire and never give up. And some native american breed too but never any noble race horse for me. It was when Petacchi won nine stages. Interesting because I was wondering what the use of donkeys could have been for Van Petegem. It doesn't seem uncommon for Italian aces to own a vineyard after their cycling career. This was also the case for Francesco Moser among others. Here you can see Cecco's "Azienda agricola", him on his bobcat working the land and an interview with him and with his son: Ignazio (with English subs). He doesn't really seem proud of his son career, a spoilt brat (hmm well as a father, he's a bit responsible for that, isn't he?) who is not enough focused on cycling. Ignazio Moser was a junior Italian pursuit champion in 2010 but retired in 2014 due to a lack of motivation and says his wiki page, "indicating that he would look to gain some work experience before working in his family's vineyards and winery." I don't speak Italian but he seems to say that the father is sincere and smarter than his son (let's say he's sincere in this particular case), the son is too flawed and incapable of doing anything. And then it ends with a big insult towads Ignazio. Apparently, also the brother/uncle Enzo Moser passed away in 2008 in a tractor accident. Franco Bitossi doesn't have a vineyard but an olive grove. 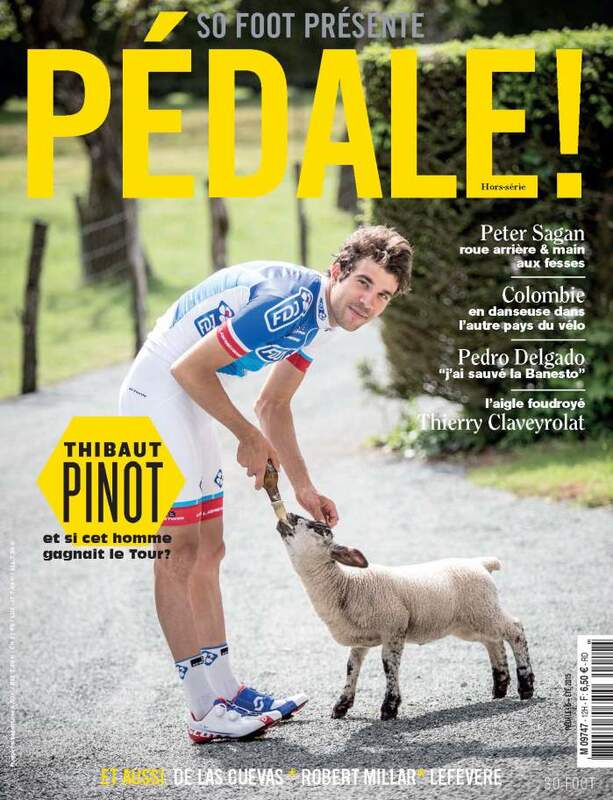 Back on the topic of donkeys, Thibaut Pinot has a very "symbiotic" (his own word: "fusionnelle" in French) relationship with his own. He also has sheep and goats. He's so fond of his goat that in order to train for the Innsbruck Worlds, he shaped in his training route in the form of a goat. If you once go to his place, you understand it all. He lives where nobody would go dwelling. He's at the end of the end of the last path of the last road of Mélisey, in the Haute-Saône département. He's deeply rooted and could not go elsewhere. He's got goats and sheep. His attitude is opposite to what it could be, given where he is, as he's young and enjoys fame and is relatively fortunate. In many other sports, with equal talent, he would be in Switzerland or in Monaco. Pinot, when he visits a football match, he doesn't go to the VIP corner but in the turn among the fans shouting. That is Pinot. Mathieu Coureau who co-wrote the book with Madiot then notes that both have this need for roots in common. We quickly understood that but a company like Française des Jeux does not necessarily share the same opinion. At the same time, they admire that. Thibaut had offers to move a few kilometers away to Switzerland and pay less taxes. But no! We heard him say: "I am French. I pay my taxes in France and I live in Mélisey." Thibaut is doing his sport. He has a hard time dealing with all that goes with it, such as media obligations. Reading the Madiot book made me like Thibaut more than before, to be honest. When you have a home - more precisely, when you have what in German is called 'Heimat' -, you're simply happiest there. Moving to some other place, especially if it's for purely financial reasons, won't make you anywhere near as happy. And this feeling has to be particularly strong in those who, at their heart, still are a lad from the countryside. So I'm moving home in three weeks. I use to feel that way too (said it on this forum a few years ago, I think) but not anymore. At this moment, I really feel like migrating but perhaps if I ever do I would feel homesick after a few years abroad, who knows what our future will be. However, I know a little about the region where Pinot is living in, the Franche-Comté, Eastern France. I once visited a friend, over there, took the train from Nancy to Belfort and when you leave the station of Épinal toward Belfort, you look through the window, it's woods EVERYWHERE! Just amazing and so different from Belgium. 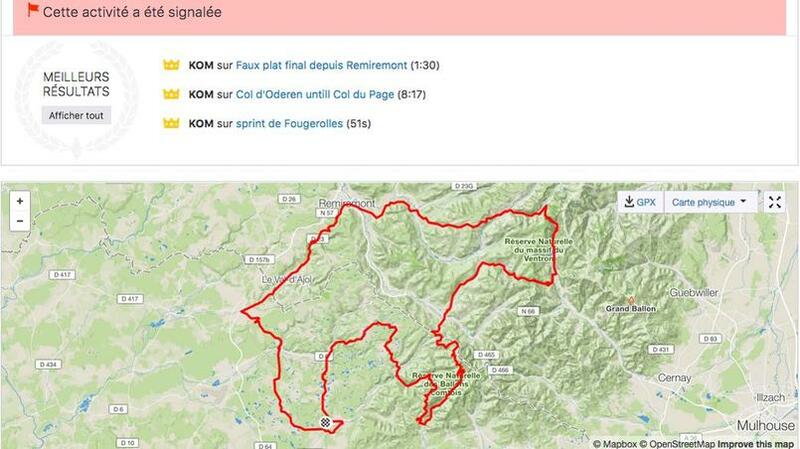 No wonder that several of the best French cyclocrossers of the last decade came from that region. So I'd understand that Thibaut would not wish to leave his place for a million. So Thibaut's father Régis is the mayor of Mélisey. Before the 2017 Tour of France, Thibault was "sick" to see that one of his chickens had been killed by a fox. He's got eight goats and 12 sheep. His sheep, Tititte, has been fed with a baby bottle since birth. When he's away on a race, his girlfriend Claire, his father or a cousin are busy with the animals. "We've always handled it with the family", says the father. There has always been animals at the Pinot's, for at least three generations: chickens, cows, horses. Thibaut Pinot appreciates that there be few people on this piece of land where he bought a pond and had his house built, on the very place where's great-grandparents' house burnt a century ago. He'll spend his whole life there. It's a region that fits me very well and that is very little known. May it remain so! I'm at piece here. Nine times in ten I'm riding alone and I'm counting on my fingers the number of times I'm crossing a car. Says Arthur Vichot, the other member of the comic duo at the Fdj bus. Pinot doesn't deny it.